Heat oven to 350°F (325°F for dark or nonstick pans). Grease two 8- or 9-inch round cake pans, or spray with baking spray with flour. Make and bake cake as directed on box for 8- or 9-inch rounds. Cool 10 minutes; remove from pans to cooling rack. Cool completely, about 1 hour. In medium bowl, beat whipping cream with electric mixer on high speed until slightly thickened. Gradually beat in powdered sugar until stiff peaks form. Fold in brandy. In another small bowl, mix pie filling and almond extract. On serving plate, place 1 cake layer, rounded side down. Spread with half of the whipped cream, then 1 cup cherry mixture to within 1 inch of edge. Top with second layer, rounded side up. Frost top with remaining whipped cream. Spoon remaining cherry mixture over top. Sprinkle with sliced almonds. Store covered in refrigerator. 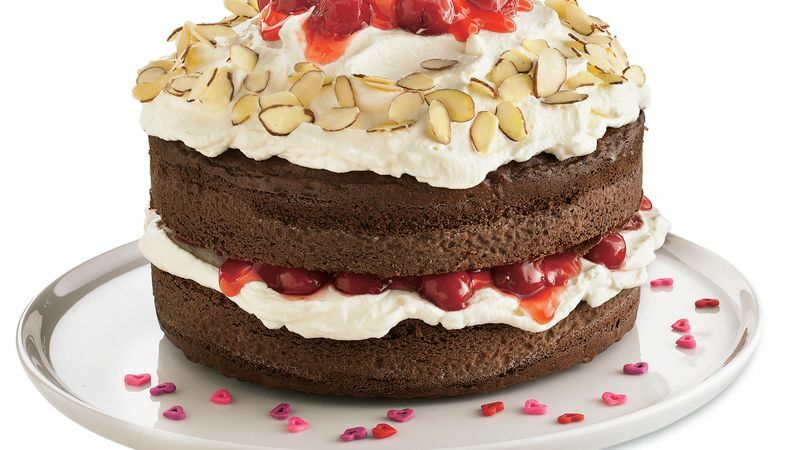 "Black Forest" usually describes desserts made with chocolate, cherries and whipped cream. If you start with a chilled bowl, the cream will whip up much faster.